Affordable helicopter tours over Charleston, SC. Conveniently located at Patriots Point in Mount Pleasant. Custom tours available upon request. 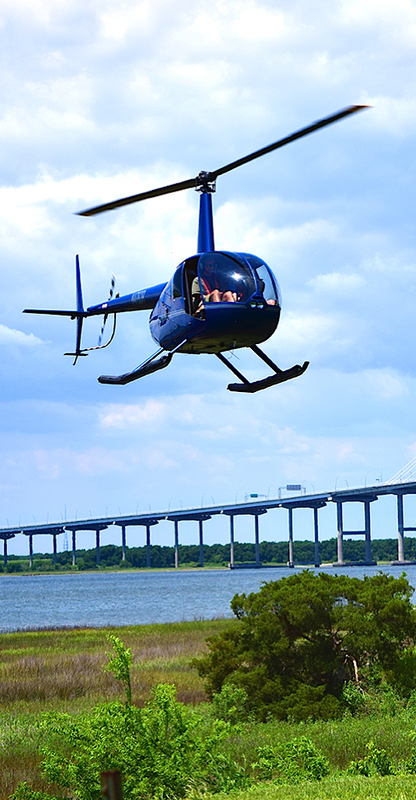 Don’t miss the chance to take a helicopter tour over Charleston. Fly In Helicopters at Patriots Point offers an exclusive tour of the Holy City that is a “must do” for any visitor. Daytime flights over the naval museum exhibits, USS Yorktown, Charleston Harbor, and surrounding beaches provide breathtaking views and photo opportunities that even locals enjoy. Check out our tour options! If your question isn’t answered below please feel free to contact us. -Yes, no single passenger can exceed 300lbs, and total combined passenger weight cannot exceed 600lbs. We reserve the right to weigh all passengers to determine a safe weight and balance for the aircraft. These restrictions are subject to change based on weather conditions. How many passengers can fly at a time? -We can take up to 3 passengers at a time, and we must sell a minimum of 2 tickets to fly a tour. What if we have more than 3 in our group? -We will separate your group into different flights according to passenger weight. -Our age limit is 3, but it is generally up to the pilot’s discretion. Can we take photos and videos on our flight? -Yes, please do! We just ask that you keep all cameras and mobile devices inside of the aircraft at all times, because we would hate for you to lose all of your amazing photos you will take. -Unfortunately Patriots Point does not offer military discounts on the helicopter tours, however there is a discount offered on admission to the USS Yorktown.